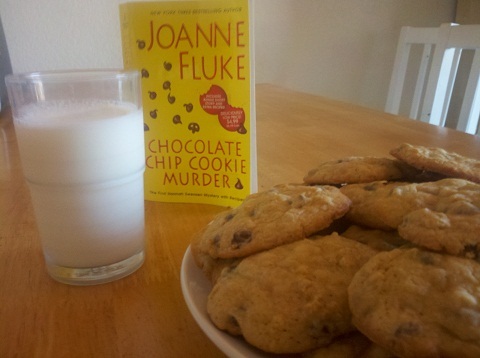 I read Chocolate Chip Cookie Murder by Joanne Fluke a little over a year ago. The novel was just ok, but I was intrigued by the recipes. It just took me a while before I tried one of them. 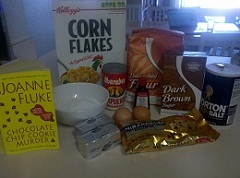 The novel contains several recipes but I decided to try the cookies who gave the novel its name – chocolate chip cookies. Chocolate chip cookies are an American classic, and this recipe has a little extra crunch thanks to the addition of corn flakes. I like to eat the cookies while they are still warm with a glass of milk on the side. I also prefer when the cookies are a bit chewy. However, I must say that I prefer “regular” cookies without the addition of corn flakes.